Deseo Ceramica. Save with taste. Traditional elegance of Italy. This is Cielo. New items in the door section. "Colored explosion" with Tubadzin Unit Plus collection. We have experience in the sphere of sales of a ceramic tile, plumbing fixtures, heating and the accompanying materials of nearly 20 years. Everything has begun in far 1999 when the group of young and talented supporter businessmen has begun activities for creation trade organization in Kherson. Which would specialize on realization of materials and products for construction and repair. In the 2000th year the firm has begun the work with deliveries of an inexpensive ceramic tile and plumbing fixtures. During this period the staff of firm has concentrated the efforts on search of permanent partners. In that time the shop has been open in one of districts of the city, for fixing of positions in the market of Kherson. This shop became a peculiar base for studying of consumer demand. At the end of the 2001st year the range was expanded shop, having added expensive ceramic tile, sanitary ceramics, decorative facing panels, varnishes and paints to the available commodity groups, construction chemistry Along with it active work on expansion of client network was conducted. In the 2002nd year in the center of Kherson the salon shop of the specialized direction, to the address Kommunarov St., 33 (nowadays - Vorontsovskaya) has been open. The name was the most suitable - "SANTEHNIKA-PLITKA". It were a difficult task for heads of firm – to gain trust and sympathies of potential buyers. As a result – shop ”SANTEHNIKA-PLITKA” has begun to work with many enterprises of Kherson and area. Among the first clients who managed to be involved in collaboration by our firm there were such known and powerful enterprises of the region as: CJSC KRUZ, "Hersonsky morsky torg_velny port", CJSC HOTD-97, SMU – Zhilpromstroy-1, PMP "V_RA", software of "Alko-Opt", etc. 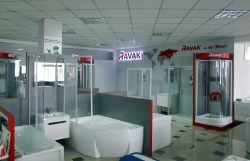 In 2003 the Plumbing Fixtures Tile shop became the official dealer of the Kiev company "Agromat". Today the Agromat company is known practically to all global manufacturers of a ceramic tile and plumbing fixtures, his defining role in development of the domestic market of ceramics is obvious to the expert, for the Ukrainian consumers the name "Agromat" became a synonym of the word "ceramics". The company successfully works with more than 100 producers of a ceramic tile and plumbing fixtures, and is their official distributor in Ukraine. All production with which Agromat works respectively and our salon, is certified and is on sale with a guarantee from 1 to 10 years. Today dealers of PTK "Agromat" are also located practically in all large regional centers of Ukraine, to Kharkiv, Dnieper, Kryvyi Rih, Kropivnitsky, Nikolaev, Lviv, Khmelnytskyi, , Odessa, Rovno, Zaporizhia, Vinnytsia, Ivano-Frankivsk. In 2005 the Santekhnika-Plitka shop has begun wholesale trade in ceramics products in the region. Commercial relations have been deal with famous importers of sanitary ceramics and plumbing fixtures. The size of floor spaces has exceeded 1000 sq.m. 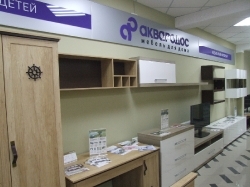 Since those times his second name was - "AGROMAT KHERSON" By 2010 "Agromat Kherson" has developed into the modern center where except a tile it became possible to buy wall-paper, laminate and a parquet, a modelled decor. After reconstruction the total area of Shopping Center Agromat Kherson has exceeded 3000 sq.m. In 2012 the "Agromat Kherson" when the size of floor spaces has reached 5.000 sq.m have been added the departments of sale of upholstered and cabinet furniture, curtains, doors, lighting, paints and plasters. Today the active living position, stability and obligation of firm have helped to achieve trust of private clients, designers and architects, solid organizations and to become partners. Such approach was appreciated by the companies having good reputation. Production which is delivered by our firm decorates thousands of rooms across Kherson, Nikolaev, Kakhovka, New Kakhovka, Voznesensk, Skadovsk, Iron Port and many other cities, villages. One more service which we provide to our clients, – an opportunity to work under the order. The most exacting buyers can pick up production from catalogs of factories and issue the order, as in shops, and directly at office. Today successful functioning of the enterprise is ensured by more than 100 highly skilled employees, many of which stand at the origins. Enormous experience, helps us to understand needs of our clients better. To be our employee means not only to have well paid and dear work today, it also confidence in tomorrow. The enterprise has already managed to prove it. The main objective which is set for shopping center "Agromat Herson" – the maximum satisfaction of requirement for builders, architects and designers and also for the people who are engaged in arrangement of the housing. Trade policy in which the management of firm sees the key to success can be formulated briefly so: "Production of the best Ukrainian and global manufacturers – at the prices, optimum for buyers".